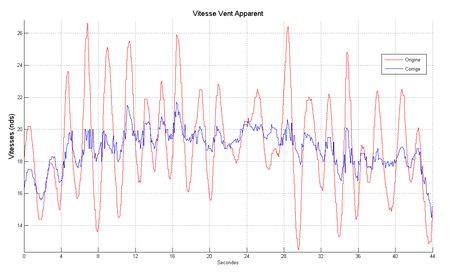 When taking a wind reading from the masthead, the acceleration or “whip” at the mast head creates disturbances in the performance of the wind measurement, these disturbances are “noise” in the signal. Imagine a boat at anchor on a calm day without wind in 1 meter swells. 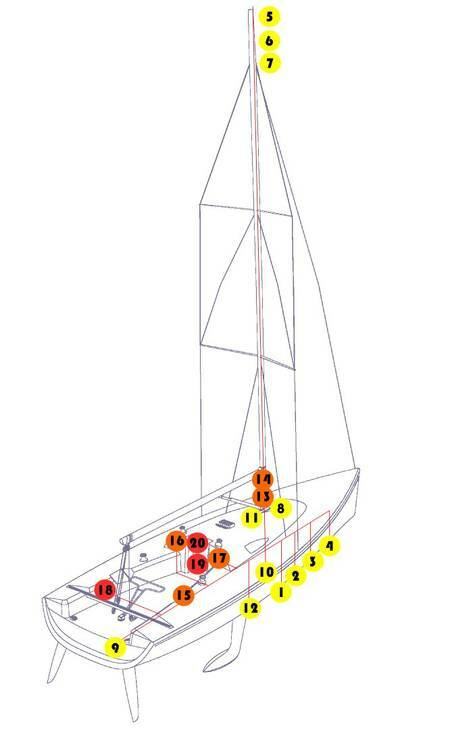 Although there is no wind, the swells induce movement at the mast head resulting in a measured speed and angle. Every 7 seconds, there is a swell. As the swell impacts the boat and ride up to the crest, the mast head accelerates aft. Then as the boat moves down the crest to the trough the mast head accelerates forward. Once in the trough of the swell, the mast head then accelerates aft once again out of the trough. The resulting effect on the mast head is circular in that the measured wind is directly related to the movement of the mast head and height through the swell cycle. The common strategy of mitigating the swell effect is to average the wind measurements over a set duration of time. This method provides and approximation used to estimate the apparent wind. 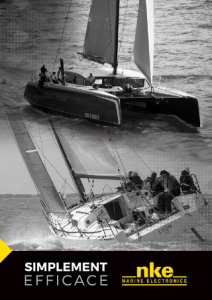 An advanced strategy is to measure the movements of the boat and compensate for known factors, such as the height and acceleration of the wind sensor. With these know factors, an advanced calculation can be done which reduces the “noise” and proves usable data in near real-time of milliseconds as opposed to the standard method of several seconds average. While it might appear excessive to spend money to save a few seconds, the necessary sensors perform advanced calculations. The time adds from the calculations, resulting in the ability to attain a performance edge over the competition. By quickly calculating the real, true wind in milliseconds as opposed to seconds which is what the competition is doing, both tactical and strategic advantages are gained! Due to the advanced speed of the pilot (often times quicker than the helmsman); it reacts quickly without delay and adversely affecting performance. The sensors on the boat provide the pilot the data to provide the calculations in near real time resulting in a performance advantage over the competition!